Since Thanksgiving, it seems, we have been talking about Christmas. We're trying to remember whether the strings of outdoor lights were still working well enough to hang again, trying to decide whether to have a Christmas tree this year, and trying to find gift ideas for one another. It's so hard to find good gifts when we don't need or want anything (thank God for providing what we have and contentment with that)! So we're starting to talk about family gifts, and the one that keeps coming up is a new television. Ours is on its way out, but it still works. So we're looking at affordable options--and everything that goes with a new TV and new technology, like TV stands for flat screens. I am still sick! The doctor prescribed a very effective cough syrup, but it makes me sleepy. As a result, I've mostly been resting--which is probably not a bad thing. I just finished reading Lonestar Sanctuary by Colleen Coble; this is the first of her books that I've read. I liked it but didn't love it. It's a quick read, and the Kindle version is currently free, so I am not complaining. 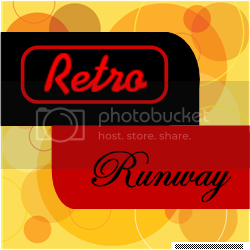 Finally, don't forget that the next installment of Retro Runway is coming up on December 9. Get out your old photos and link up! Hope the rest does its job and makes you feel much better! UGH hope you feel better, I've hanging on to this stupid cold :(.